Thank you for visiting! We hope you find the information within to be helpful and informative. See what we are up to, share with your friends and come back often! You are welcome to contact us through our contact page or e-mail us directly at info@stowheritageringers.com with any questions about performance opportunities or the ensemble itself. Be our friend on Facebook or check back here to keep up on the latest happenings. Drop us a line and let us know where you are ringing this season. "I can’t adequately tell you how much our group appreciated your performance. We were truly spellbound by it all. What an art. What beauty you create. And the icing on the cake was your willingness to allow some of us at the tables to take your bells for a “test drive” to see what it’s all about! It was perfection in every way. I mean this sincerely. You created an event I will never forget." "I was thinking of all the things that made this Christmas so special. One thing that stood out to me was the SHR concert. I had never seen the group in concert before. With all my years ringing with you, I had wondered if it sounded as good as I thought it did from behind the table. I wondered if the group's excitement about presenting new pieces came across & if the audience was as entranced by the music as I was while ringing it. The answers are all a heartfelt YES!! It was great to "experience" the performance. The music was wonderful! All the hard work really does pay off. Listening to the recordings doesn't do it justice. To watch and listen was magical! Even the songs I had previously played with the group took my breath away experiencing them from a listener's perspective. The talent and dedication of everyone shows! Kudos for a wonderful concert! And the instrument keep growning!! We recently received a wonderful donation of the lower 7th octave of chimes! Yahoo!!! We humbly extend our gratitude for such a generous donation and look forward to incorporating the new additional into our music. 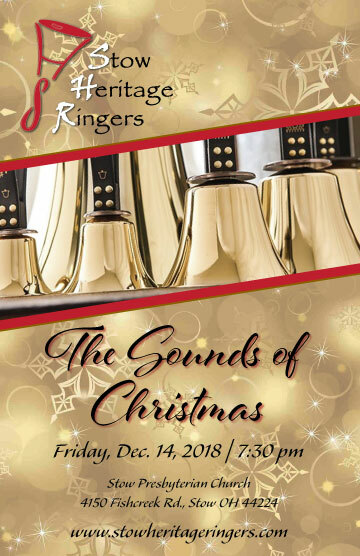 78 bells, 72 ChoirChimes, 28 hands and 14 accomplished musicians make up this dynamic ensemble, specializing in the artistry and teamwork of English Handbell ringing. 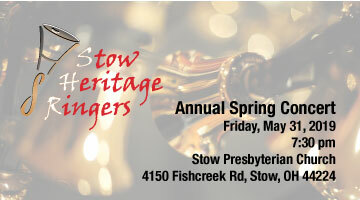 Stow Heritage Ringers has been entertaining audiences since its inception in 1996. 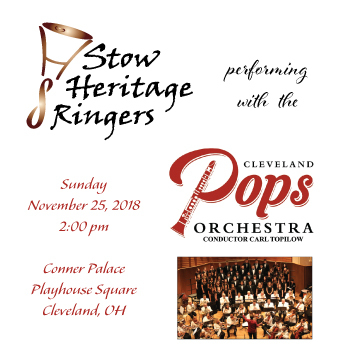 This advanced handbell ensemble draws musicians from the greater Northeast Ohio area and is dedicated to presenting programs that share the diversity of this unique instrument. We welcome the opportunity to share our love and knowledge of handbells with you! SHR regularly performs in Ohio and western Pennsylvania, sharing a variety of musical styles. Performance repertoire includes original compositions, arrangements and transcriptions from classical to contemporary music, both secular and sacred. Stow Heritage Ringers, Inc. is a proud member of the Handbell Musicians of America. SHR rings on six octaves of Malmark handbells and seven octaves of Malmark ChoirChimes. Stow Presbyterian Church has graciously served as our host since 1996. Their support and generousity have been invaluable to our success. Thank you SPC! Copyright 2013 Stow Heritage Ringers, Inc. . All rights reserved.